Our organization is engaged in manufacturing and exporting a wide range of Viscose Scarves. These exclusive in multi-colored checks can also be availed in customized designs, patterns and sizes. Our range is made using perfectly chosen yarn and with perfect fabric, These are known for the perfect finish and stitching. Banking on the skills of our qualified team of professionals, we are instrumental in offering Ladies Scarf. we are manufacturers of scrafs. our range extends from printed polyster to printed voils. wooven wools to patch wools.. In order to keep pace with the never-ending demands of customers, we are involved in offering a wide range of Ladies Casual Scarf. 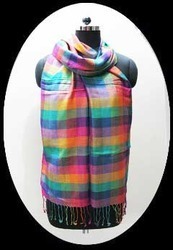 In order to attain maximum satisfaction in the market, we are preeminent in offering Colorful Scarves in many colors. in offering a vast array of Printed Scarves. These are extensively used by women of all age groups and are wide in demand. They are available with us in different patterns, color combinations, colors, prints and intricate designs as well. There are number of varieties available at our end with wide options of colors and patterns to choose from. 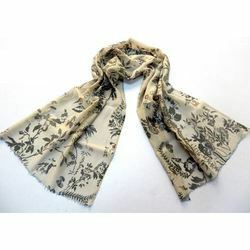 With the active support of our team of experts, we are engaged in offering a huge assortment of Printed Viscose Scarves. Available at market leading prices, these Viscose Scarves are stringently quality tested on industry set quality parameters before approving for final delivery. Minimum Order Quantity : 1000-1500 units.